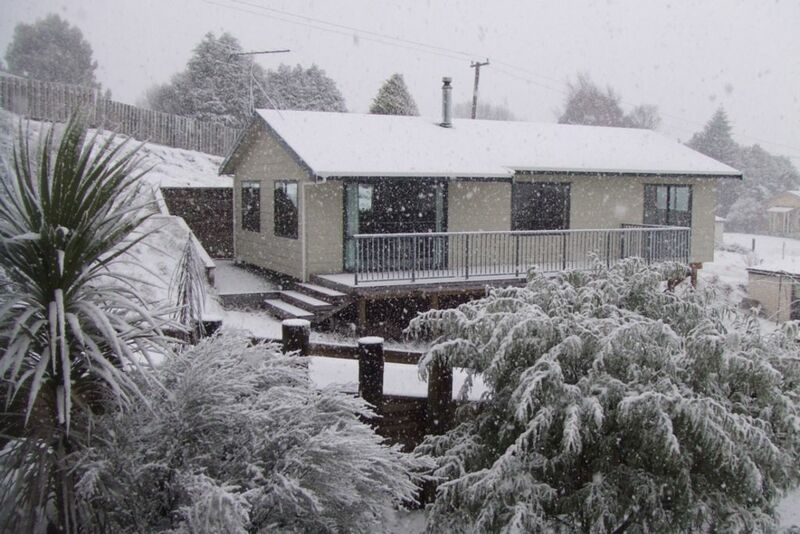 Ski HQ is a three bedroom Ohakune chalet offering a great base after a long day on the slopes! Come back to a warm and cosy place, sit down, relax and talk about your escapades on the mountain. This Ohakune chalet is in great condition, featuring an open plan layout of the kitchen and living area allowing the place to heat up quickly with the wood burning fire. The kitchen has all the mod cons - electric stove and oven, microwave, fridge / freezer and dishwasher. The dining table in the living area is a great focal point to tell stories about the day's adventures over dinner! A TV and DVD guarantees some light relief in the evenings, and you can bring your MySky card to plug in and have your sky channels with you on holiday. There are plenty of board games, cards and activity sets for young and old, and best of all... the Shotski... you need to try this! A hot, high pressure shower will also help after a hard day on the slopes! The sleeping accommodation of this Ohakune home provides two bedrooms each with a queen bed, as well as a third room with a queen bed and single bed. There are electric blankets on all the beds, so you will be warm and toasty through the night! The wood burning fire pumps out plenty of heat, and additional column heaters ensure you are at the perfect temperature. There are laundry facilities provided, as well as ample storage. Parking off road for four cars, including a car port under the house. Enjoy the panoramic rural views towards Raetihi and the Paraparas from the deck, where you are welcome to utilise the BBQ and enjoy a relaxed meal with your group! Ski HQ is located close enough to the Junction so that it is only a short walk to restaurants and bars! Come and base yourself at Ski HQ for your next snow mission! Location was ideal for what we wanted. Plenty of space and very warm after a day on the snow. Great value ski chalet. The log burner cranks the heat out! 5 minute walk to the Keg. Definitely recommend. Lovely tidy cosy place to stay. We would stay again. Great spot with everything you could need. Will defiantly be back.